Buy Octane Q37x Elliptical Trainer - FREE SHIPPING! The console is simple to navigate, whether you’re choosing Quick Start or an advanced workout – or whether you’re connecting to SmartLink. You choose the level of technology you want to fuel your workout. The Q37xi console accommodates your iPad with three placement options – Watch, Read and Surf. The large display screen simultaneously displays all your workout data, and only Octane offers SmartLight technology. SmartLight signals how hard you’re exercising, if you’re in your target heart rate zone and when to prepare for the next interval in a Workout Booster or CROSS CiRCUIT. Now that’s smarter training. The Q37 features close pedal spacing (only 1.8"), so your body is properly aligned from head to toe, thereby minimizing pressure on the lower back. Because the body feels so good during workouts, you are more likely to stay on longer and keep coming back. 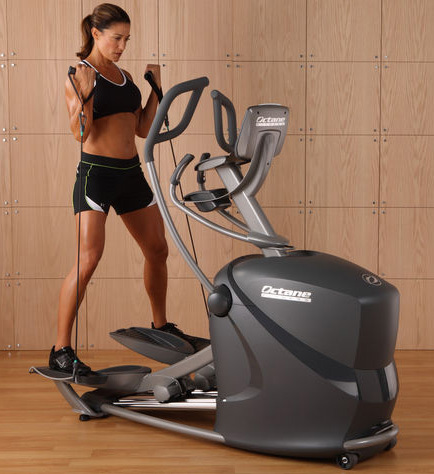 Significantly shorter than other premium elliptical machines or treadmills, the Q37 fits virtually anywhere at home. With its low step-up height and rear access, it’s simple for everyone to get on and off safely. Octane Fitness delivers premium, ultra-durable ellipticals that are built to deliver long-lasting, superior performance. Home elliptical machines are subject to the same rigorous testing and uncompromising standards that Octane is known for in order to produce high-quality equipment that offers reliable operation and ease of ownership. Plus, Octane stands behind their products with a five-year warranty on parts and one-year warranty on labor. The best elliptical workouts just got even smarter – and so did you – with SmartLink, the unique app that becomes your best workout partner. SmartLink links your fitness goals to real results – with custom designed workouts and tracking to keep you progressing and staying motivated! Plus, because everything is conveniently stored on the device you know and carry with you all the time, there’s no learning curve. All you do is download the app and get moving. And when you want even more variety, workouts and coaching, simply update the app and you’ve got an entirely new home gym. Embrace the new way to exercise smart -- today and into the future. SmartLink takes the most common exercise goals – Lose Weight, Feel Better, Get Stronger and improve Athletic Performance – and develops customized routines so all you have to do is get on and get after your goal. You custom the length of the workout program – and each time you log in, the app delivers a personalized workout regimen, duration and intensity level designed to stimulate progress toward your specific goal. SmartLink does all the planning and thinking for you, and you just get on and get the work done! With more than 225 exercises and 35 workout plans, CROSS CiRCUIT with SmartLink significantly broadens options for optimal conditioning. You can select the muscle groups that you want to target and the tools you want to use, and the app delivers an ideal regimen. With instruction and motivation from the workout videos, all you have to do is keep going. Plus, workouts are added frequently – all you need to do is update the SmartLink app to access a multitude of new options that enhance your video collection. Workout Tracking SmartLink makes it easy to see and share your progress, as it automatically stores your workouts and preferences and tracks your sweat session details – all in one convenient app! Octane’s exclusive Workout Boosters, including X-Mode, GluteKicker and ArmBlaster, energize exercise with periodic intervals that deliver the ultimate in cross training and help make workouts more effective and efficient. You follow prompts such as squat, lean back, pedal fast and more to blast the entire body. With SmartLink, these Boosters take on a whole new level of excitement with valuable video demonstrations, tips and coaching. This virtual personal trainer pushes you to perform and adds variety and guidance to keep you progressing. The SmartLink app delivers five workout programs and more than 225 pre-designed routines, so you can capitalize on multiple options to keep workouts fresh, motivating and effective. Choose from golf strength, cycle strong, yoga stretch, shoulder and back strength and much more. As your body adjusts to routines and enters a maintenance phase, the best way to continue progressing and seeing results is to constantly vary workouts and stimulate muscle confusion. With muscle confusion, you’re taxing different muscles in various ways so that they must constantly adapt and get stronger to meet new challenges. All Octane Fitness elliptical bases have connection points to attach the resistance CROSS CiRCUIT Powerbands at the front, along the sides and at the back of the machine. For even more versatility, a CROSS CiRCUIT Kit includes two side steps, which let you take your legs out of the action and isolate your upper body, along with three additional sets of Powerbands to vary resistance for different exercises or to add challenge as you progress. With CROSS CiRCUIT, no two workouts ever have to be the same. You and your body benefit from the ultimate in cross training – with cardio only on some days, cardio and upper-body strength on others, cardio and lower-body strength on other days, and so on. Add other accessories, such as a stability ball or kettlebells, for even more strength training options. Octane elliptical machines and CROSS CiRCUIT together are infinitely more than just cardio equipment – they are a total-home gym with virtually endless variety. Octane Fitness is the only elliptical that offers both a cardio and strength workout in one location. Take the CROSS CiRCUIT experience to the next level of intensity for maximum caloric burn with the CROSS CiRCUIT Pro kit. Get more out of your workout when you use a Polar non-coded chest strap for wireless heart rate monitoring. This simple, straightforward elliptical provides exceptional performance and unbeatable value—and outstanding results. Enjoy the innovative and dedicated programming of CROSS CiRCUIT+™ as you alternate on-machine cardio with off-machine strength sets to get a great, efficient workout. The optional Powerbands and side platforms are a convenient and effective way to enhance your strength training efforts. Add Octane’s signature workout boosters—xMode, ArmBlaster and GluteKicker—with customizable resistance levels and interval timing, and you’ve got full control over your workout. Footprint - 26" x 65"